Bar Brahma is a cosy haven of old-fashioned tranquillity hidden amid the peeling facades of Sao Paulo's run-down city centre. Since 1948, it has stood on the corner of Avenida Ipiranga and Avenida Sao Joao - a corner immortalised by popular Brazilian singer Caetano Veloso in his song Sampa as a place where "something happens in my heart". The bar itself may not tug at the heartstrings of Paulistanos quite as much as it did in its heyday, when it was a renowned meeting-point for artists and intellectuals. But it does share its name with the object of Brazil's latest big export drive, Brahma beer, which for many years was the country's best-seller. After a series of mergers and acquisitions, Brahma is now owned by the world's biggest brewer by volume, Belgian giant Inbev, which wants to turn the beer into its third main global brand alongside Stella Artois and Beck's. This year, Brahma has been made available for the first time in 15 countries, including the UK, US, Canada, Russia, France, Australia and New Zealand. Inbev says that by the end of 2007, it expects Brahma sales outside its home market to be worth 30m euros (£20.5m; $35.3m) a year. 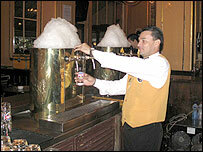 Rodrigo, who has worked as a waiter at Bar Brahma for the past four years, thinks the global launch is a good idea. "It's my favourite beer," he says. "It will spread the name of Brazil out there." As it turns out, that is exactly what the marketing men of Inbev had in mind when they decided to promote Brahma internationally. Devin Kelly, Inbev's vice-president for global brands, says the company saw the beer as a product that captured the essence of Brazil - even before they considered what it tasted like. "First and foremost, it was the emotional context," he told the BBC News website. "The culture was more important in terms of filling a positioning that we had identified on a global basis. "The emotional context of Brahma, at the heart and soul of this incredible country called Brazil, was the single most important factor." Fortunately for Inbev, the beer measured up to the image that the company wanted to push. "When we started to do trials in terms of the beer, we found that Brahma provided a wonderful opportunity for a beer that could meet consumer expectations across the globe," Mr Kelly said. "When the research came back, it clearly indicated that this highly refreshing, easy-to-drink beer was consistent with expectations of what a beer from Brazil should taste like." However, the export version of Brahma - although largely brewed in Brazil - is not quite the same as its Brazilian counterpart. "This international Brahma is from the exact same yeast strain that dates back to 1888 - it's built on the same foundation," Mr Kelly said. "But it's about satisfying consumer expectations. "It's a slightly different liquid. It has a slightly more fruity nose to it and that characteristic carries through. It still has a great beer taste. But across the globe outside Brazil, it's exactly the same beer." Packaged in a fancy bottle and sold in trendy bars, the new global Brahma is intended to convey the idea of "living with effortless flair", bringing "the Brazilian attitude and lifestyle" to consumers worldwide. But foreigners living in Brazil are highly amused to hear that a beer which they regard as an everyday product is now being sold in their home countries at a premium price. "How about 'living with effortless flatulence'?" was one expat's dismissive response to Inbev's marketing campaign. Even so, the marketing of Brahma worldwide could help the brand recover some of the prestige it has lost in Brazil itself. 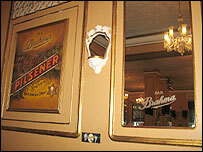 For years, Brahma was sold under the slogan "The Number One Beer" - but it now trails behind Skol, a brand to which the original Brahma company acquired the rights in 1980. 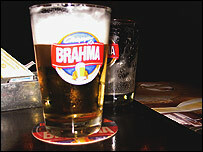 Brahma and its main rival, Antarctica, joined forces in 2000 to create the Ambev company, in a bitterly-contested merger that gave the new firm nearly three-quarters of the Brazilian beer market. 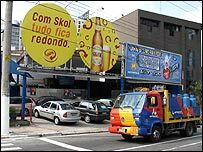 At one point, Brazil's anti-trust regulators contemplated making Ambev sell off the Skol brand - but in the end, the deal was approved without major restrictions. Part of the case for the Ambev merger was that it would create a "national champion" capable of competing internationally. But that argument sounded less convincing four years later, when the firm was taken over by Belgian beer giant Interbrew in the deal that created Inbev. 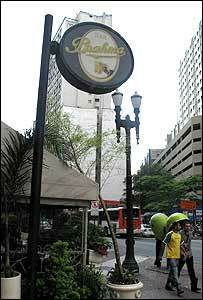 So was Brazil duped into allowing a national beer monopoly that is now foreign-owned? Ambev's corporate relations director Milton Seligman says no. He argues that because of globalisation, both Brahma and Antarctica would have been bought by multinationals sooner or later, even if they had never merged. "At the time of the merger, [Ambev] was born with a potential share of 72% of the market," he told the BBC News website. "Today we have 68.1%, which shows that the company's share didn't grow - on the contrary, it diminished. "Secondly, 15 new beer companies have been created in this period. So we have a market that has grown, in the sense that new players are operating in it. "I would say Brazil gains a lot from the alliance of Ambev with Inbev. Through us, Brazilian brand names that are the fruit of Brazilian creativity can travel the world and show another, happier side of Brazil. "It's a great opportunity to spread Brahma - a supremely Brazilian product - throughout the world." Is Brazil finally set to reach its full potential?